The Crazy Charlie is a very popular fly for targeting bonefish. It resembles a small shrimp or baitfish and bonefish absolutely love them. Lucky for us, shad are also big fans of the Crazy Charlie, and with a few minor adjustments, we can adapt this fly to meet our needs. The original fly is typically tied with bead chain eyes and either a tan, root beer, or brown wing to match the bottom of the flat that you are fishing. If fishing deeper water, hourglass eyes can be used, and since we want to target shad on the bottom of the river, the 5/32 hourglass eye is used instead of bead chain. 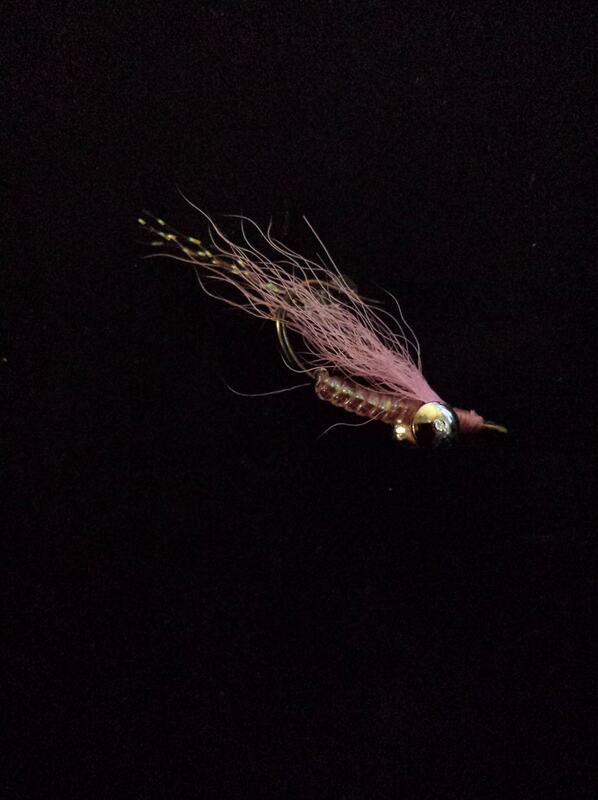 Since shad seem to like bright colors, I typically tie this pattern with pink or orange flash and wing. I do also carry the Crazy Charlie in white as well as tan, as natural colors seems to work in shallow water on clear days when the fish can be spooky. Posted on October 12, 2015 February 18, 2019 by chelenthalPosted in Econlockhatchee River Favorites, Flies, St. Johns River FavoritesTagged flies for shad, fly for shad, fly pattern for shad, fly patterns for shad, fly tying, shad fishing, shad fly pattern, shad on the fly.